Solutions to the plastic problem. I have given up taking my own bags to the supermarket – on environmental grounds. There is little more annoying than coming up with a solution to a problem, only to discover that the solution only makes the problem worse. That is precisely what the supermarket’s “Bags for Life” campaign appears to have done in trying to tackle the issue of overuse of plastic by shoppers. It turns out that few of us actually reuse these bags, thereby increasing the use of plastic fourfold when compared to a standard single use bag (that is the difference in the amount of plastic used in manufacture). The only solution seems to end the use of plastic bags altogether, with cotton or jute becoming the most likely norm. However, even this is approach is not without environmental issues and there is still a need to examine alternative approaches. As it happens there is one supermarket that has come up with a better solution and has even (perhaps unwittingly) given some scope for a little shopping “arbitrage”. Before discussing the solutions it is worth examining how serious a mistake bags for life have become. In announcing a phased withdrawal of their scheme the German supermarket chain Lidl has said that less than 1% of its bags for life were used more than once. The idea was that these bags (costing 9p) would be used many times and ultimately be handed in for recycling, at which point the shopper would get a free replacement. Stopping the programme will mean that 80mn bags, involving 2,500 tonnes of plastic, will no longer be polluting our environment. Do these statistics just say something about the type of shopper that Lidl attracts? Of course not. The 10 biggest UK retailers issued over 1bn bags for life last year – the equivalent of 44 per household – and Tesco, Morrison, Iceland and Lidl (until now) only issue bags for life. According to the campaigning group Plastic Planet, the lifetime of a plastic bag is 500 years and the UK currently throws away 300bn pieces of plastic per annum, only 9% of which is recycled. That is all very well, but what are we to take away our shopping in if not in a plastic bag.? Lidl looks like moving down the route of issuing cotton or jute bags, but has yet to decide what to charge. This will be a big issue for them given that they will not want to undermine their position as a cheaper alternative to the established UK names. Further, it is not clear that these bags are environmentally any better. While the disposal of the bags may create little damage, their manufacture may be a big ecological problem. When Defra compared cotton bags with their plastic rivals they found that they needed to be used 173 times before they were responsible for fewer carbon emissions, due to the amount of water and fertilizer needed in their production. The run-off of fertilizers used in growing cotton is thought to have a more detrimental effect on our seas than plastic. Paying more for a bag may encourage greater use, but there are limits and it certainly hasn’t worked for the plastic variety. What are the alternatives? Paper is an obvious one. Morrison’s is trialing recyclable and reusable paper bags (but only in 8 of its 493 stores), while increasing the price of their bags for life by 15% (to 15p) – it scrapped its 5p bags last year and reduced overall bag sales by one quarter in the process. The problem is making the handles strong enough and ensuring that the bags do not disintegrate before you get your shopping home. The other potentially more interesting option is compostable bags. These biodegradable bags are usual made from corn starch and are engineered to break down quickly – but not before you get home. Most of us are already using such bags to collect food waste, so why not just use the bags that you brought the shopping home in? These bags have already been adopted as the default (5p) option by the Co-op and (here is the arbitrage opportunity I mentioned) the cost is lower than buying compostable bags on a roll for your food waste. 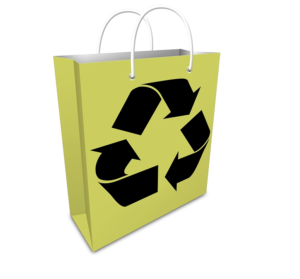 Ok, no one is going to repackage shopping bags to turn a profit, but you can see the point – we are being financially encouraged to be environmentally friendly. Rather than turning up with your bag for life (plastic, cotton or jute) it is better to have no bag and take the biodegradable option. The issue of single use plastic is not going to be easily solved. Even if we get the shopping bag choice right (and anything would be better) there is still a problem with the packaging of the goods inside the bag. So far little beyond newspapers (and only then the Guardian, which is now delivered in a potato starch wrapper) have addressed using something other than plastic. As ever, the only way to facilitate a rapid change is to make it financially unwise to resist.